I’ve just been reading about the horrific suicide of a 53-year-old woman in the Bilbao suburb of Barakaldo, who jumped to her death from her fourth floor flat as court officials arrived to evict her. As UK newspapers are reporting this morning (see FT and Guardian), this is the second repossession-related suicide in Spain in the last two weeks. Prime minister Mariano Ragoy has pledged to support struggling families but is under attack from the opposition for rescuing the banks while imposing austerity on the people. The Association of Spanish Banks has said it will call for a freeze on evictions of ‘vulnerable homeowners’ for two years. This piece about evictions by the Spanish film director Pedro Almodóvar appears on the Spanish and French websites of the Huffington Post – but not so far on the UK site. Here is my rough translation of what begins as though we are seeing scenes from a film that juxtaposes what happened in Bilbao with what I think is the memorial service in Madrid for four teenagers killed in a stampede at a party at the Madrid Arena on November 1. That is followed by the first part of Almodóvar’s main piece. As Crisis launches a campaign against ‘unworkable and irresponsible’ cuts in housing benefit for the under-25s, there is another scary reminder today of the bleak prospects for the next spending review. Fiscal Fallout, a report from the Social Market Foundation and Royal Society of the Arts, concludes that the flat-lining economy will make the structural deficit significantly higher than forecast in the Budget in March. Anyone applying to their local authority as homeless faces a new regime from today and there are real doubts about how it will work on the ground. The new power for local authorities to discharge their duty to homeless people into the private rented sector represents a fundamental break with the system established in the Housng (Homeless Persons) Act in 1977. Donald Rumsfeld would call it an unknown unknown: how many people will be forced to move miles away from home as a result of the government’s housing and welfare reforms? As a new law allowing local authorities to discharge their duty to homeless people into the private rented sector comes into force from this Friday (November 9) and the countdown continues to sweeping cuts in benefit from April 2013, it’s a question that will be asked over and over again. Where’s the evidence on section 106? The government’s plans on section 106 and affordable housing came under fire from all sides of both houses of parliament this week – and no wonder. Every time you think you have got your head around the impact of the April 2013 welfare changes you realise you have forgotten something that makes it even worse. I don’t need reminding that there are now just 147 days until the bedroom tax and overall benefit cap take affect. I know that increases in the local housing allowance will be restricted to CPI inflation from the same date. I realise that a range of other cuts in benefits and the localisation of council tax benefit and the social fund with reduced funding come in at the same time. There is good news, bad news and really bad news in figures out today on housing supply in England. 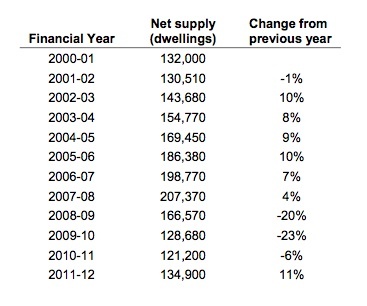 The good news first: net additional housing supply rose 11 per cent in 2011/12 to 134,900 in 2011. That follows three consecutive annual falls in the wake of the credit crunch and represents a return to the level seen in the early 2000s. Net additional supply is the government’s preferred measure since it includes not just new build homes but gains and losses from demolitions and conversions of buildings from one use to another too.